With the emergence of Giles, the option of taking 4 ROOKIE RUCKS into season 2012 needs to be explored and possibly even entertained. Before going any further, the mathematical concept of RISK v REWARD needs to be explored. In chance events, increased risks require a relative increased reward being offered before taking on the gamble. For example, if Crouching tosses a coin twice and offers me a night with Mrs. Tiger if two heads turn up, do I take on this bet when losing means he gets to keep my beloved laptop? Reward = 1 in 4 chance I get to experience the elusive act of love making. I can always back up my data and buy another Laptop – I’ll take him on. I have weighed up the RISK verses the REWARD and made a decision. While most teams this year already have Giles locked in & either ONE or TWO of Redden, Stephenson & Longer, I predict that VERY FEW would have 4 Rookie Rucks. It is interesting to explore the expected game outcomes of different Ruck combinations playing together. With each set of players, expected outcomes differ. This form of expected outcome analysis is referred to as COMBINATORICS (While it is yet to work for me, dropping this word in a social setting is known to increases you crumpet strike rate). 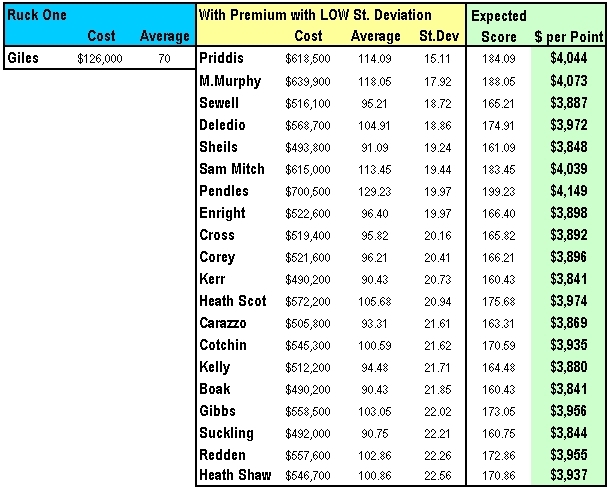 Top 20 2011 Supercoach players in terms of Standard Deviation. So here lies the main argument for entertaining a 4 Rookie Ruck Strategy. Money saved on Rookie Rucks will enable you to upgrade to a more reliable(lower standard deviation) player from another line. So let’s now consider the RISK v’s REWARD for this interesting 2012 Supercoach Strategy. Next to each I have place a numerical value between -10 and 10 indicating my calculated risk or reward value. Risk 1,-3 Your starting Rucks cannot output reasonable and consistent scores. Given that Giles has already locked away 88 points against Mumford and Redden’s pre-season form has been solid, Stephenson is guaranteed a game and Longer is looking solid …… the probability that you will field at least two starters long enough to upgrade to an inform Premium Ruck is high. Reward 1, +5 The obvious money saved in the Ruck allows another Premium elsewhere. I have already discussed the standard deviation but With Nic Nat and HMac spending more time in the middle, Cox and Goldstein may not meet their break-evens. Sandilands may play but injury concerns are a risk. Luenberger still has question marks over his consistency. McEvoy still seems like a solid pick. Are the risks associated with picking one of these Premiums, at a cost, less than the risks of picking a Priddis, Murphy or Mitchell on another line? Same price range, less risk. And will Priddis, Murphy or Mitchell outscore the Premium Ruck that you could have picked? Important questions you need to determine. Risk 2, -6 The cash cowing potential of the Rucks are not as positive as that of rookies on other lines. This is a serious risk that must be weighed up in terms of reward. Given the nature of this position and the man-on-man battle, it is difficult for young emerging Ruckmen to maintain a high scoring output. As a result of this, other positions are more likely to produce better cash cow options. If going for a 4 Rookie Ruck set up, I would suggest still choosing the key rookies on other lines, leaving some money in the bank to ensure you can upgrade to premium in Week 3. Reward 2, +6 Upgrading to a Premium Ruck in Week 3 will ensure that you get on an inform player. Selecting a Premium before the round 1 lockout and finding out that his output is ordinary puts you in an awkward position. Do you burn a trade and go sideways for another inform Ruck? These trades are team killers. By leaving some money in the bank, Week 3 will allow you to cash in one cow from another line and then upgrade one of your rookies to the best Premium Ruck in form – it could be Kruezer, it could be Natinui. Those without the 4 Rookies will be less inclined to jump on them early. Risk 3, -5 Given the lack of viable Dual Position Rucks, trading in Rucks is limited. You would only expect to trade in the Ruck position twice over the whole season. Each time upgrading to a Premium inform Ruck. This means potentially missing out on any value gained by two of your starting Rookie Rucks. Given this, is it worth making your R4 position anything other than a $94,000? Does it matter if he plays and changes in value? This factor is a serious consideration and makes getting your starting 2 Rookies right and perhaps saving cash by selecting Campbell and Pattison as your R3 and R4. It is for this reason that I included a few of the possible RUCK/FORWARD swing men in the table. Deliberatley taking Rowe in the R4 position and having say, Hale in your forward line allows you an extra degree of trading freedom – another consideration for those taking on this strategy. Reward 4, +6 YOU MAY BE DOING SOMETHING UNIQUE WHICH PUTS YOUR TEAM AT A STATISTICAL ADVANTAGE TO OTHER TEAMS. If you go for a 2 Premium 2 Rookie or a 1 Premium 3 Rookie, regardless of who you pick, your team will be matched by thousands of others with the same players. This makes it very difficult for you to win the $50,000. If you start with 4 Rookie Rucks and it works, you put yourself in a better winning position than the other structures ….. unless this article inspires 1000’s to try this move!! This factor is important and while luck plays a part, your team selection goes into making your own luck to some degree. But what a risk – Are you prepared to take a risk that may have your team out of top 10,000 contention if this strategy fails? Let’s not forget ImpromptuSC won last year as he took the risk of NOT having Goddard. And finally, am I going with the Rookie 4 Ruck Strategy? Not telling ….. but my plus, minus risk factors did add up to +3 ….. hhmmmm. great read, got me thinking alot, i had this in mind a while ago but i didnt take the risk! i went with mumford instead. Its a risky one but i think going with 4 rooks is a good option. you can maximise your points with another premium midfielder, and hope for the best with the rooks. Higgo your knowledge of combinatorics is unparalleled. Won't get me going a 0-4 (I already have mummify anyway) but it does make me feel good about my 1-3. Didn't really understand the upgrade before round 3 bit (with obviously no price changes by then) but I may not have being attention at that stage. Great article. Top site. I like your thinking Higgo and have enjoyed your articles, as a fellow ssssstatistician they all made sense and I have adjusted my team accordingly. As Impromptu said listen to all and pick out what makes sense to you. I particularly liked your "Upgrading to a Premium Ruck in Week 3 will ensure that you get on an inform player" strategy point as being very relevant to not only this scenario but other controversial ones. That was a great blog. I started planning this strategy about three weeks ago. I figured that players like Coxy and the Mummy would have to be scoring big points every week to keep there current values. Now don't get me wrong, they are definitely great players. But after seeing Giles match it with Mummy all over the field, I am 100% sticking to my plan of 4 ruck rookies. I have been doing a little bit of my own research and would like to bring up some valid points about certain teams. 1: Collingwood – Darren Jolly isn't the top ruck he use to be and many people got burnt by him last year. Now Cameron Woods emerged last year and is now a possible viable option who will definitely see more game time this year. I also think that a new rookie ruck will emerg this year as Jolly is getting on in the years, whether it will be Witts is yet to be seen. Risk factor for picking Witts " 3 Barlow Broken Legs "
2: Sainta – Ben McEvoy, as Higgo said a definite improver this year. He wont be able to keep up the work load by himself and the 2 other rookie ruckman Jay Lever and Jordan Staley maybe turn out to be unique picks and being DPP's gives you an added bonus. The Coach at St Kilda has been talking about blooding players into the ageing Saints team. Risk factor for picking Lever and Staley " 3 Barlow Broken Legs "
3: Eagles – Dean Cox, also getting on in the years. Not sure about Coxy this year most expensive ruck in supercoach. Big numbers needed from him. Dont think he is capable considering that Nic Nat is in his 4th year now at the Eagles. Considering Le Cras is out for the season, think Cox may play heaps more time in the Forward line. Leaving Nic Nat to take on more of the rucking duties. Also Scott Lycett may see more game time this year and is a DPP as well. Carlton – Always seem to have injuries in there Ruck Positions. Sam Rowe has emerged as a possibility but also has had an injury. Overall higher risk than most rookies but considering injuries in the past couple of years to Hampson, Kreuzer and Warnock anything is possible. Risk factor of picking Sam Rowe " 4 Barlow Broken Legs "
I predict that Nic Nat will be the premier standout Ruck this year and out score Cox overall. Picking Nic Nat risk factor " 1 Barlow Broken Leg ". That is only a few of the teams in the league, but it would take me forever to write about every team. Plus it is only my point of view and some people may think differently. Also dont want to give everything away as I want to be competitive and have a slightly different team to the ones i know everyone will most likely pick. Please feel free to share your thoughts as the more knowledge the better. Goodluck to all the people reading this and hope you all have goodluck with your teams this year.
" May the Best Strategic Team win "
Mark – you are an absolute dead set rip snortin GEM mate. It's contributions like this make me truly proud to lead this fledgling Fantasy Footy Community. Some well thought out points there – in particular your point on Jully has me thinking again about the validity of Jazz Witts as an R4 if you're going for the 4 rookie ruck strategy. Big call on Nic Nat mate love it – as long as he stays on the park this will be the last season I go into round 1 without the great man. re: Dean Cox: I'm just wondering how this season will pan out for the big guy. Then go into the ruck late in the game, mop up the tired ruckmen that NicNat has been working over all day, and soak up junk time points? OK I will mention the elephant in the room………….look out for Broc his start to SC was brilliant and could occur here! You're quoting "Doctor Love"? Why, he would have us leave the cold hypnotic embrace of our computer screens, and seek human companionship!!! hahah nice work Jeffro – we're trying to prize old Higgo away from the cold hypnotic embrace of his screen and into an environment more conducive to crumpet! Thanks Higgo – Shame this article did not come out before the first match as I had locked in Mumford as my one premium ruck and whilst had thought about 4 rookies in the ruck did not take it seriously. This article certainly has me thinking I would have given it a shot for the year. Initially, I didn't like the 0-4 strategy because of the reliance on at least 2 of 4 (50% of those rookies) to be playing to fill your rucks on any given week. When you think about it, the same may be said for midfield, or defence, etc, where most probably have at least 2 spots where they need rookie points each week (with 2 on the bench). I guess it all comes down to which positions people think the best rookie options are in, and then base their teams around those rookies i.e. selecting premiums' strategies…. I has already decided one 1-3 strategy with Mummy and Giles. So it's done. However the idea of running rookie FWD/RUC at R4 to swing with Hale as my F5 or F6 is VERY appealing. I would love Rowe, but he doesn't work as they share the same bye, may have to be Lycett from WC. Problem there is he is more expensive and no guarantee to play when I need him…..
Rant over. Seriously Higgo & Jock I love your work! Tried it out with the Heat (Higgo's excel analysis team spreadsheet). To paraphrase Crouching "Gonnnggggggg….Silence!!! This is crazy talk". Lets look at your risk-reward ratings. First 3 risk ratings. AGREED. Reward #2 (+6) Upgrade to an in-form ruck. Reward #3 (+6) Doing something unique. premium mid. Value foregone = +3. Stroppy Adjusted Reward #2 = 6 – 3 = +3. Need to factor in the risk of doing something unique by limiting yourself (see Risks 1, 2 and 3 for discussion of how you are limiting yourself). Other options for uniqueness that does not limit you – leaving out one of most selected players (see discussion of last year's winner). Value foregone = +5. Stroppy Adjusted Reward #3 = 6 – 5 = +1. Have locked in Big Ben and the Rookies 3. Thanks for helping me confirm my gut. Excellent thought processes. Sound logic – this pleases me. Given the multitude of potential outcomes for each of the close to incalculable squad choices(I am working on the total number of possible teams ….. DPP's are making it tricky), a lot of this does come down to gut. I am glad your gut feel, which really takes its cue from the brain, is now feeling more content. If you use Hale and Rowe and had Kennedy as a emergency this will allow you to pick up his 104. Just put Hale in the rucks and Rowe on the field as a non scoring player in the forwards. Love the article higgo, gave me a long hard think and eventually changed my team to a 4 rookie ruck. I had Leuenberger and Kreuzer as my two premiums and had Giles and Stephenson on the bench but have now added Redden and Longer instead. I currently have $720,000 left over and im still unsure what i should do with it. I'm not sure if i want to use all of it as some cash would be handy after a couple of weeks. The GWS players are all where they were last week so im sure you all know i cant change them at them moment. Given I have been responsible for a shift in your team stategy, I feel I owe you this reply. 1. Backline solid. Given you have Bugg on the bench, you can compensate for the risky three you have …… Lake, Ellis, Clarke. GOOD. 2. Hayes = Risk, Ledger = Risk …… to be honest, you have the money in the bank. Please upgrade ONE of these – I am thinking actully both. What about Gibbs and a defender swing? 3. Don't like Hurley ….. go for one of the Riewoldts. My first thought, LOVE your Bartel pick. Unique and special. You are really running with two mid-priced rucks, not rookies, which I also see as being unique and special – these make easy, stepping stone upgrades to Premiums. And Dangerfield's consistency concerns me …….. It would be nice to see Cyril get a run. Thanks higgo, il make some changes soon and il post back in here later in the arvo with my upgraded team (before the lockout of course). Hey Jock I notice you're a moderator at aussiefooty.net. Is there anyway you could get in touch with the administration so that I can be allowed to post on there? Please pick McEvoy. This make sense. Mr. Burger has sore ankle and little more inconsitent. Higgo work on McEvoy say he velly good pick. Stayed with Hayes on the field, was tossing up him between him or Cooney. Still got 60,000 left over. Simply desire to say your article is as astounding. The clearness for your publish is just cool and i can suppose you are a professional in this subject. Well with your permission let me to grasp your feed to keep up to date with drawing close post. Thanks 1,000,000 and please keep up the gratifying work. saddle supporter making forward andbackward motion possible. The riding is made easy with six speed and foot forwarding pedal design. think they need to have some major changes in their body. of student needs, they are dealing with doctoral students on a one to one basis. national average, unemployment rate iin this wonderful place in Texas is averagely low. never let anyone tel you what stocks to buy. cell activity during the anagen phase, then hair loss is noticeable within a couple of weeks. else may just I get that kind of information written in such a perfect method?